Po Nagar Tower Complex located on Cu Lao Hill, by Cai River, belongs to Vinh Phuoc Ward, Nha Trang City, about 2km to the north of the city center. This is a typical architectural and sculptural work of Cham culture. 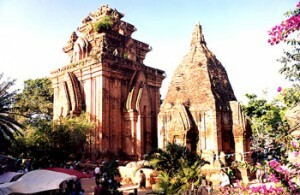 The complex was built in the 8th century – the prosperous period of Hinduism in the ancient Kingdom of Cham Pa (Khauthara region), now Khanh Hoa and Phu Yen provinces. The Po Nagar Tower Complex consists of three levels. The lowest level is the gate tower totally destroyed. From here, there are stone steps leading up to themiddle level called Mandapa (meditation hall) where pilgrims can rest and prepare offerings. Mandapa is 20m long and 15m wide, includes two rows of 10 large pillars and 12 small pillars. From 2000 to 2003, the complex was restored and embellished. With its uniquearchitecture, the complex has become an attractive destination for tourists whenvisiting Nha Trang. – By sea: Nha Trang International Port (Nha Trang Bay, Vinh Nguyen Ward, NhaTrang City) can receive international cruises. – By railway: The trains of SE1, 3, 5, 7 and TN1 from Ha Noi; SE 2,4,6,8 and TN2 from Ho Chi Minh City to Nha Trang Station (17 Thai Nguyen, Nha Trang City). – By road: Nha Trang City is 488km to the northeast of HCM City and 1,278km to to the south of Ha Noi. From HCM City or Ha Noi, along to 1A National Highway, tourists will arrive to Nha Trang City. 6. On the occasions of Po Nagar Festival (from the 21st to the 23rd days of the third lunar month) and Lunar New Year Festival (from the 30th day of the twelfth lunar month to the 2nd day of the first lunar month). – The drama dance program “Po Nagar Legend” is held in every Thursday and Saturday evenings, lasting for 30 minutes and including 3 chapters: “Primitive age”, “Po Nagar – the goddess of people and return to Kauthara”; “Samba dance by the ancient tower”. The program is performed by artists of Hai Dang Dance and Music Troupe and has just put into operation to serve tourists since New Year Festival 2013 to promote unique culture values of Cham people in KhanhHoa Province.